In 1972 a Range Rover became the first vehicle to traverse the two American continents from north to south. 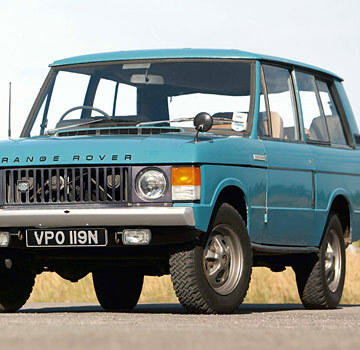 This weekend marks the 42nd anniversary of the invention of the Range Rover. So what better time to celebrate its boxy beauty and rugged practicality, which have helped earn the original SUV its classic status? It was designed in the mid 1960s by Charles Spencer King, a British engineer who before coming to Land Rover had developed a gas turbine engine for Rolls-Royce. King wanted a vehicle that had all the performance and capability of their signature Rover with the comfort and handling of an on-road touring car. The Range Rover would have a V-8 engine and four wheel drive with disc brakes—the first ever on a vehicle of that kind. Early models were utilitarian, with vinyl seats and plastic dashboards designed to be washed down with a hose. Luxuries like wood and leather interiors, air conditioning and carpets would come later. But that's not to say that it wasn't revered for its style. Shortly after its release, the Louvre museum in Paris exhibited the Range Rover as an "exemplary work of industrial design." Not immediately sold in the US, they crossed the Atlantic via the grey market until 1987, when it was officially offered in America and became as known for its exclusivity as for its performance and durability.